At work we have WiFi everywhere. If you go to a meeting you take your laptop with you. If you go to do some work at someone else's desk on another floor, you take your laptop with you. 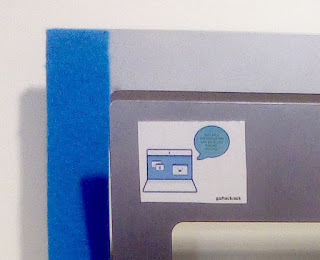 If you need the bathroom, well you will probably take your laptop with you, but where do you put it? 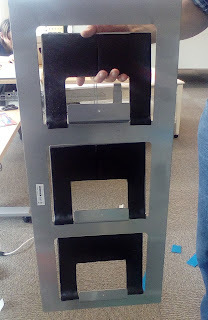 Given an idea, a 24 hour company hack-a-thon, a team of keen hackers, we set out to design, build and install 13 laptop racks around the office. 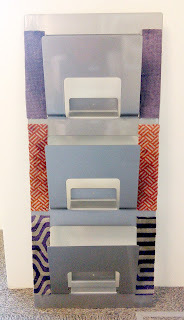 This is a modified Ikea Spontan magazine rack. I'll cover some of the steps we took to make it. We started with the base Spontan. 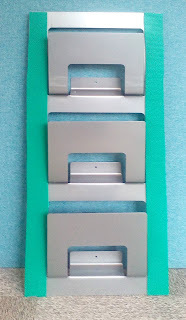 The Spontan is made of metal (with an enamel coating). While it is designed for magazines and newspapers, it is quite strong, and can hold a laptop fairly easily. One of the problems though is that the metal surfaces may scratch the body of our precious laptops. We needed a padding solution. We want padding on the "inside" of the rack, so the part that you can't see. 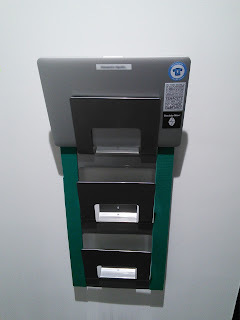 This must extend down to where the bottom edge of the laptop will rest. 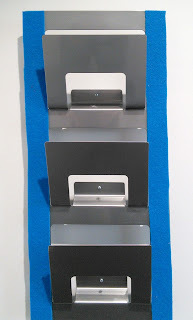 We also need padding on some of the front Facing Surfaces, as the laptop will rest against these as well. Enter Reverse Garbage. Reverse Garbage gets industrial discards that are useful for re-purposing. Perfect. My first find was a roll of high density foam that is self adhesive on one side. This is the edge of a larger sheet (presumably). The roll I picked was about 15cm wide, and several metres long. 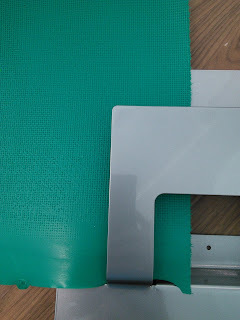 The white part is removed to reveal the self adhesive backing. 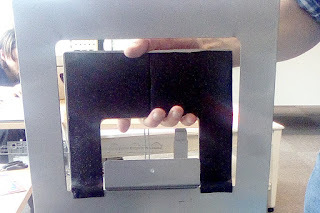 We cut pieces of this to size, and stuck it on the "inside" surfaces of the rack. For the front facing surfaces my first thought was to find some kind of thick fabric. I ended up with 3 great purchases from Reverse Garbage. 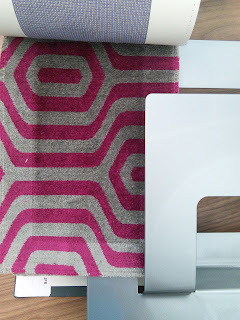 The first was an offcut of a roll of "event carpet". They had 3 colours (blue, pink and green) of which I grabbed some blue. 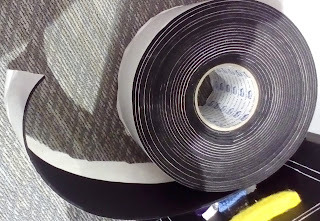 The roll was about 2m x 4m, which set me back $10. 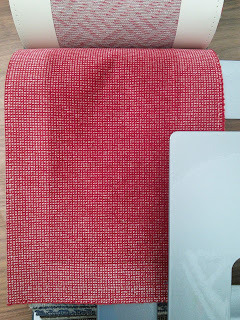 Next was a book of fabric samples for chairs. I figured we could cut up each sheet into 2 strips, which would make an interesting design. Here's are a couple. Third was a sheet of polyurethane. These look like offcuts from making thongs (flip-flops). They are quite thin (2-3mm) but provide enough padding so that a laptop won't scratch. Attaching the covering to the front facing surfaces ended up being more of a challenge than I had expected. 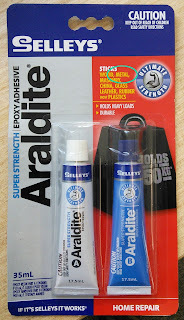 I researched glues that would stick to metal, and 2 part epoxies like Araldite seemed to fit the bill. 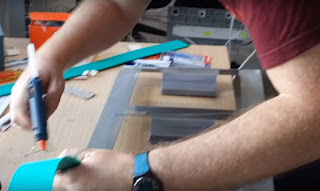 The problem of course is that with 13 racks to build and mount in 24 hours, mixing up and applying a 2 part epoxy is going to take a lot of time. We experimented with hot glue, but it didn't stick well to the rack. We ended up getting some sandpaper and roughing up the front facing surfaces that needed padding, and then using the hot glue. I wasn't totally satisfied with the bond, but there won't be a lot of lateral pressure, so it should stick pretty well. I think if any need re-sticking I will use Araldite. Of course beware that hot glue sets fairly fast. You need to glue in sections. Here's our first prototype with the green polyurethane on the front. The chair covering ended up being more fiddly than expected. I was quite proud of the finished product, but we only made one. In the end the blue "event carpet" was our favourite. I thought mounting the racks might be a challenge. The rack weighs about 1kg. 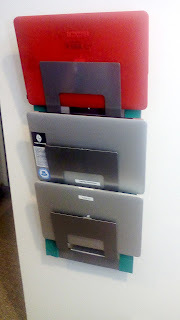 With 3 laptops attached the total weight could be 5-8kg. We needed to attach the racks to plasterboard (drywall). On the advice of my good friend Mark I investigated various attachment strategies on YouTube. It seemed like some kind of toggle screw would be the best. I ended up getting a box of Ramset Super Wallmate self drilling plasterboard anchor screws. The toggle sits sideways inside the anchor screw. You screw this into the wall. It has a sharp point and is self drilling. Then you place whatever you want to mount in place, and screw in the holding screw. 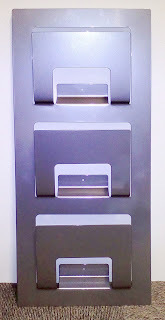 As the holding screw goes in, the toggle flips sideways inside the wall, and tightens against the inside of the wall. 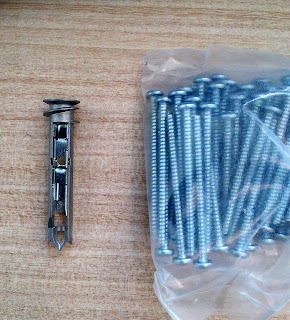 Each screw can hold 20kg, so more than enough for what I need. So how did we do? For our hack-a-thon we were awarded the non-technical prize! Thanks heaps to Alex, Malcom, Ricardo and Yuting, and especially for Alex and her video production work for the presentation!